Looking for a "dressed-up" cupcake recipe? We’ve got it! 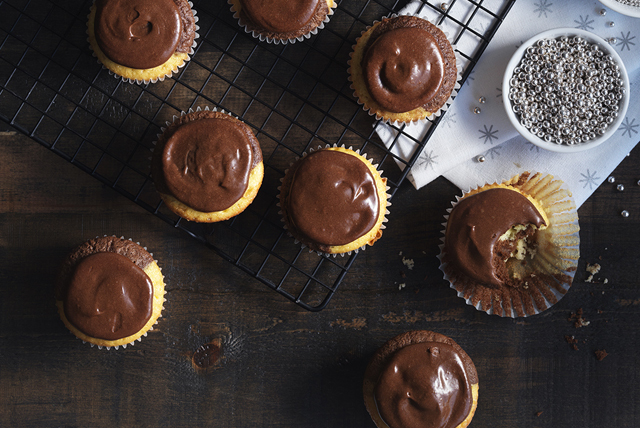 Try out our Black and White Cupcakes recipe. Microwave 3 oz. chocolate in microwaveable bowl on MEDIUM 2 min. or until chocolate is almost melted; stir until completely melted. Prepare cake batter as directed on package. Pour half the batter into separate bowl; stir in melted chocolate. Spoon about 2 Tbsp. of each coloured batter, side by side, into each of 24 lined muffin cups. Bake 18 to 21 min. or until toothpick inserted in centres comes out clean. Cool in pans 10 min. Remove to wire racks; cool completely. Meanwhile, microwave remaining chocolate and Cool Whip in microwaveable bowl 2-1/2 to 3 min. or until chocolate is completely melted and mixture is well blended, stirring after each minute. Spoon chocolate mixture into resealable plastic bag; seal bag. Cut small piece off one bottom corner of bag; use to pipe Cool Whip mixture onto cupcakes, adding about 1 Tbsp. to each. Stir 1 Tbsp. Irish cream liqueur into the Cool Whip mixture before using as directed.